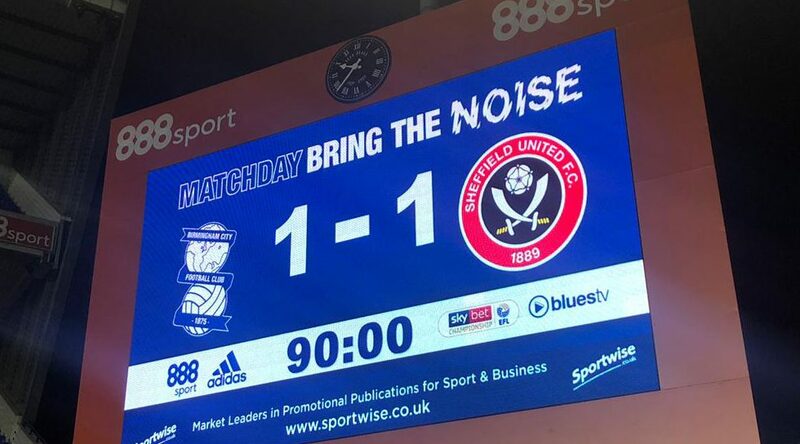 Blues welcomed Sheffield United to St Andrews in what was a tasty midweek fixture. Blues, buoyed by their 1-0 win against Leeds, welcomed another high-flying team with promotion aspirations of their own. The blades defeated Preston at Deepdale 1-0 last time out with David McGoldrick’s first half tap-in securing all three points for Chris Wilder’s side. It was another tough game for Blues and one that would have major implications at both ends of the table. Garry Monk made one change to the side that were victorious against Leeds on Saturday with David Davis replacing the injured Mikael Kieftenbeld. Sheffield United started the game with a real bit between their teeth. The Blades are a team who are very calm and composed on the ball and, after a nice interchange of passes involving Duffy and Stevens, the ball was slipped into the path of Sharp in the penalty area. Sharp with his back to goal and with Dean tight to him, was unable to get a shot away but his clipped cross to the back post was just too high for the on-rushing McGoldrick. Blues, who for the opening minutes of the game had hardly had a sniff in the game, almost took the lead in bizarre fashion. Mahoney drove towards the Sheffield Utd defence and slipped Gardner in down the right. Gardner’s early cross took a wicked deflection of Stevens and had to be superbly clawed away by Henderson in the Sheffield Goal. Blues were growing in confidence as the first half progressed. Maghoma managed to drop a shoulder and put a cross into the box which fell into the path of Dean. Dean, who was in close proximity of the penalty area, slashed wildly at the ball and his volley went well over the bar. It was a chance he should’ve done better with. There is a reason why Sheffield United have been one of the best teams in the league this season and they broke the deadlock in the 38th minute. Duffy drove towards the area and slipped the ball into the path of Stevens. Stevens took a touch and rocketed the ball past Camp into the back of the net. Camp managed to get a hand to the ball but the strike was so powerful he had no chance. Blues though, as they have done time after time this season, responded immediately. Mahoney and his corners have been a secret weapon this season and once again it was the source of the equaliser. Mahoney‘s whipped in corner was met by Gardner who powered a header at Henderson. Henderson was only able to palm the ball into the path of Morrison who was first to the ball and the Blues skippers scuffed effort looped into the back of the net to make it 1-1. First chance of the second half fell to the away side. A quick free kick routine from Norwood found McGoldrick’s run at the back post and his effort on the stretch was saved by Camp. It was a clever routine from Sheffield United and one that Camp needed to be alert to. Garry Monk on the hour mark decided to bring Jota on for Mahoney. The Spaniard’s first real contribution in the match was immediate and brilliant. He drove with the ball towards the Sheffield defence and threaded the ball behind the defence into the path of Adams. Adams took it early and his fantastic effort was beaten behind by Henderson. Jota was beginning to cause the Blades a number of problems and, after brilliant hold up play by Adams, saw his curling effort from the edge of the box saved by Henderson again. Blues were defending well and Morrison’s positioning was brilliant to prevent Stevens header across the box from falling into the path of Sharp. It was a vital interception from Morrison with the lethal frontman unmarked in the box. Sheffield United were pushing forward for a winner and in the last minute had a massive chance to win the game. Norwood floated in a corner that was met by McGoldrick but from 6 yards out he skewed his header wide. It was a huge chance for the Republic of Ireland International and one that he should’ve at least hit the target with. It’s hard to really comment on Camp’s performance. He didn’t really have much to do at all. He came and collected crosses well and he was alert to prevent McGoldrick from scoring midway through the second half. There wasn’t particularly much he could’ve done to prevent Steven’s goal but he will be disappointed to not have kept a clean sheet as he had relatively little to do all game. I am a huge fan of Colin and again he produced a solid performance. Colin defended well and was very calm on the ball throughout the game. With Gary Gardner being the only central midfielder who is able to pass the ball accurately, the argument for Colin to start alongside Gary is a good one. It was good from Colin last night but I feel he has a lot more to offer. Morrison gets an 8 tonight and that has precisely nothing to do with the fact he scored the equaliser. Morrison’s rating is based on how incredible he was in defence. Arguably the best performance he has ever produced wearing the Royal blue, which there are many of, Morrison was a class above. His positioning, all round reading of the game and leadership skills were on full display last night. Morrison dealt with Sheffield United’s lethal striker Sharp with ease and his positioning mid-way through the second half to prevent Sharp from scoring close range was vital. Our Captain was brilliant last night and we all hope that his contract situation gets resolved as soon as possible! I’m a bit unsure of Dean at the moment. Whilst he performed reasonably well against the Blades I still feel he isn’t performing at the high standards he set at the start of the season. Dean marshalled McGoldrick and Sharp well and did as best as he could to tame the lively Duffy. However, Dean was shaky at times and his reluctance to clear his lines surrendered possession back to the away side on a number of occasions. Perhaps a tad harsh on a player who didn’t particularly do much wrong on the night but it may be time for Garry Monk to bring in Marc Roberts in place of Dean. Another strong and positive performance from the Dane. Pedersen’s physically and determination was a perfect match against a physical and determined side in Sheffield United. Pedersen’s marauding runs forward and composure on the ball were much needed assets for Blues last night and he stuck to his task of dealing with Sheffield’s attackers very well. I don’t think Gary has had a bad game from us since joining on loan from the 25 years without a trophy club in Claret and Blue. Gary was a real presence in midfield and dealt with the exceptional Norwood reasonably well not allowing him to create many openings for the Blades. Gardner almost opened the scoring in bizarre fashion early in the first half with his cross taking a wicked deflection off Stevens and forcing Henderson into making a great save to claw the ball away. I thought Mahoney was lacking in confidence and belief in himself last night. Mahoney struggled to really get involved with the game and it seemed like he didn’t really want to get on the ball and drive at the defence. Mahoney played a key role in the goal with his corner leading to Morrison’s equaliser; however, it was an uncharacteristically quiet night from one of Blues best players this season. Just like Mahoney, Maghoma was virtually invisible throughout the full ninety minutes. I don’t want to keep criticising Maghoma but it seems to be a recurring theme for him to have one good performance and then several really below average ones. Maghoma was wasteful in the final third and he squandered possession a number of times. With an away trip to Ipswich next up for Blues on Saturday it may be time to drop Maghoma and start Mrabti. Juke fed off scraps for most of the night but as usual he does what he does so well. His hold up play, selfless running and bringing others into the game was on full display. Egan, Basham and Cranie are really good Championship defenders and Juke tried his best to make life difficult for them all night. He wasn’t involved in the game as much as he usually is but he still put in 100% and produced a battling performance. Adams was superb tonight and performed his role as Blues main attacking outlet brilliantly. Adams pace and movement really stretched the Blades defence and his clever running caused the Blades a lot of problems. Adams, who had a quiet first half, really came alive after the introduction of Jota on the hour mark. Adams linked up well with the Spaniard and had a number of efforts well saved by Henderson. Che was unable to get on the score sheet; however, he produced a really mature performance against his former club. Craig was on the pitch for only 10 minutes and I can’t really remember him touching the ball. He didn’t get booked straight after coming on though which in itself is a great achievement. Absolutely fantastic support from the United fans. To bring 2600 fans down the M6 on a Wednesday night is a brilliant effort. They were loud all night and a credit to their team. From a selfish point of view, I hope the Blades don’t go up as a visit of Sheffield United to St Andrews is a fixture I look forward to every season!